IAIA17 registration is closed. Participation required pre-registration and pre-payment by 15 March. No on-site registrations will be accepted. IAIA17 PAYMENT & REFUND POLICIES: Registration is not confirmed until payment has been received and a receipt has been issued. 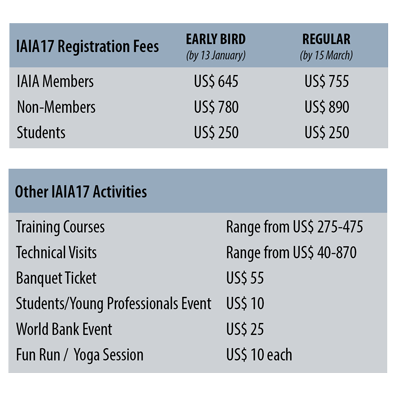 Pre-registration and pre-payment by 15 March 2017 is required for IAIA17; cash payments on-site will not be accepted. If an invoice is required before issuing payment, you must request one via email. IAIA will refund registration fees upon written request received before 15 March 2017. A US$125 processing fee will be retained. After 15 March, no refunds will be issued for cancellations or no-shows. Substitutions for paid registrants may be made in writing without financial penalty. Refunds will be issued after the conference.